The Catalog Archive Server (CAS) provides access to the object catalogs and related data from the Sloan Digital Sky Survey (SDSS). It is a companion to the Data Archive Server (DAS), which allows users to download raw (FITS) images and spectra from the survey. The SkyServer provides the Web interface to the CAS. The SDSS catalog data is stored in a commercial relational database management system (DBMS) - Microsoft's SQL Server. The data is therefore organized in several 2-dimensional tables. The tables and their relationships to each other are referred to as the schema in database jargon. 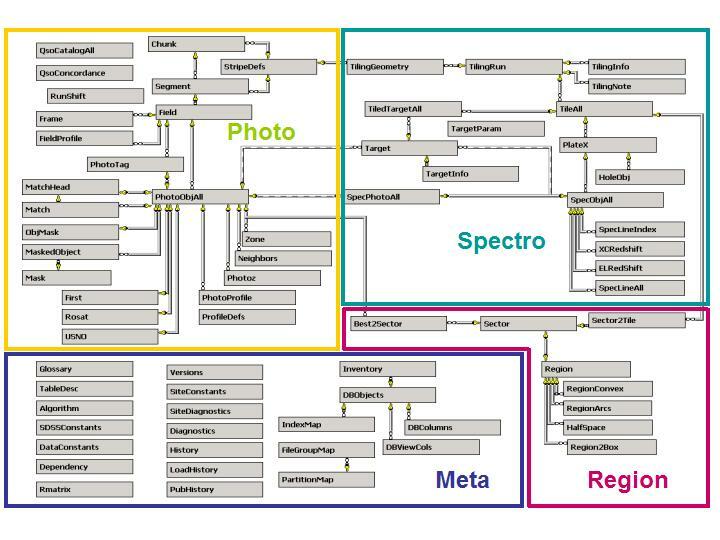 There are 3 different types of data in the tables - imaging data is in the photo group of tables, spectroscopic and tiling data is in the spectro tables, and other data such as documentation or other information about the photo and spectro data, i.e. metadata, is in the meta tables. Some tables are also created specifically for speef or convenience, for example the SpecPhotoAll table, which contains a pre-computed join of relevant fields in the PhotoObjAll and SpecObjAll tables. the BEST dataset is contained in the BESTDR7 database, and represents the latest, greatest calibration of the raw data. BESTDR7 is the default database for queries. Other databases must be explicitly specified (see below for sample syntax). The TARGET dataset is contained in the TARGDR7 database, and represents a snapshot of the data as it was when the target selection algorithm was run on it, i.e. it is the calibration upon which the spectroscopic targets were chosen. Preserving this data version is important for doing science with the data. Both databases have the identical schema (tables), but different data. The BESTDR7 database also contains the spectroscopic and tiling data, whereas the TARGDR7 database only contains imaging data. The vast majority of queries are run on the BESTDR7 database. There are two other databases currently in the CAS - RC3 and Stetson. These contain photometry of objects from the RC3 and Stetson datasets that match SDSS objects. Each database contains a single table - the PhotoObj table in RC3, and the Stetson table in Stetson. Please see the SQL Intro page for further help with SQL queries. We have build a spatial indexing scheme called the Hierarchical Triangular Mesh (HTM) that spatially decomposes the region of the sky that is covered by the SDSS data and enables much faster spatial searches of the data by coordinate cuts. The important tables and views are described below. For each table, the views and indices are defined on that table are described in brief. For more information, please see the Table Descriptions help page as well as the links to the Glossary entries that are incorporated in the table listing below. PhotoAuxAll View for PhotoAuxAll for backward compatibility with DR5. It selects the required columns from PhotoObjAll. PhotoTag - This is a vertical partition of the PhotoObjAll table, and contains only those columns that are most often requested. Due to the smaller size of each row in the table, many more rows can be loaded into the memory cache at one time, hence searches on the PhotoTag table are much faster than searches on PhotoObjAll. Whenever possible, use the PhotoTag table instead of PhotoObjAll or PhotoObj. Segment - This table contains the basic parameters associated with a Segment, which is a unit of data corresponding to a single camera column within a chunk. Field - This table contains all the measured parameters of each imaging field, along with relevant summary statistics, and astrometric and photometric information. Chunk - A chunk is a contiguous section of imaging data within a stave (stripe for the south). It consists of complete North and South strips between lower and upper mu limits. A chunk is composed of a set of touching but non-overlapping primary segments (or parts of segments). 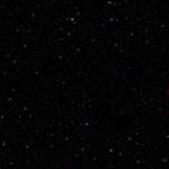 Match - This table contains PhotoObj (primary and secondary object) pairs from different runs (observations) that probably are the same object. In effect, this table records multiple observations of each object. MatchHead - Thhis table records the canonical object from each match cluster, and cluster statistics. The observations for an object (as recorded in the Match table) form a cluster named by the minimum objID in the cluster. MatchHead has summary information about the cluster keyed by the objID. First, Rosat and Usno - These tables contain matches between the FIRST, ROSAT and USNO survey objects and SDSS. SpecLineAll - A compendium of all the spectral lines found in all the spectroscopic objects in the SpecObjAll table. Contains all the parameters measured for each spectral line. There is a SpecLine view of this table that contains only the lines that have been measured. SpecLine A view of SpecLines objects that have been measured The view excludes those SpecLine objects which have category=1, thus they have not been measured. This is the view you should use to access the SpecLine data. SpecLineIndex - Precomputed spectral line indices. These are combinations of spectral line intensities used to determine various properties of galaxies, like age or metallicity. TileAll - Contains information about individual tiles on the sky. Tile A view of TileAll that have untiled=0 The view excludes those Tiles that have been untiled. TiledTargetAll - This table stores information that keeps track of why a Target was assigned to a Tile. TiledTarget A view of TiledTargetAll objects that have untiled = 0 The view excludes those TiledTarget objects that have been untiled. TilingGeometry - This table contains geometrical information about tiling regions, including tiling boundaries. The TileBoundary view serves up the boundaries. TilingBoundary A view of TilingGeometry objects that have isMask = 0 The view excludes those TilingGeometry objects that have isMask = 1. See also TilingMask. TilingMask A view of TilingGeometry objects that have isMask = 1 The view excludes those TilingGeometry objects that have isMask = 0. See also TilingBoundary. TilingRun - Contains basic information about each run of the tiling software. TilingInfo - Contains information on what happened to a Target in a run of tiling software. SpecPhotoAll - The combined spectro and photo parameters of an object in SpecObjAll. This is a precomputed join between the PhotoObjAll and SpecObjAll tables. The photo attibutes included cover about the same as PhotoTag. The table also includes certain attributes from the Tile table. The CAS uses a Microsoft SQL Server database to store and serve the data. Users can access this data by a number of methods. Radial search. Allows entry of a central coordinate, radius, and constraints on the five simplified magnitudes (ugriz). This query returns ONLY the object coordinates, type. simplified mags with errors, and the object id, as well as the quantities necessary to get data from the DAS (run/rerun/camcol/ field/obj). SpecList. This page performs dynamic cross identifications of the SDSS spectroscopic objects with a user defined list of (plate, mjd, fiber) values. In order to avoid congestion on the server, the list is limited to 1000 objects, and to a size of 80KB. The SDSS Query Analyzer (sdssQA). This is a fully self-contained, downloadable Java application that allows submission of SQL queries to the database. It also includes a version of the Schema Browser, and a variety of example queries. With the sdssQA you can open multiple database connections, run multiple queries, and save the output to files on your local disk. Users wishing to run complex SQL queries will want to use this tool. The sdssQA can be downloaded from this page. Documentation on using the sdssQA is also available. Users should read our SQL help and the descriptions of the data model and the parameters stored in the various tables. Emacs interface. This interface, developed by Robert Lupton, which can be downloaded here. Robert has provided some example queries, and there is additional documentation available for this tool. Our SQL help and the descriptions of the data model and the parameters stored in the various tables are also applicable. sqlcl command line interface. A straightforward command line interface written in Python by Tamas Budavari. The tool can be downloaded, and some help found, on the sqlcl page.